Shivnarine Chanderpaul (born 16 August 1974) is a former Guyanese international West Indian cricketer and former captain of the West Indies cricket team. Considered as one of the greatest but forgotten greats in World Cricket, Chanderpaul is the first Indo-Caribbean to play 100 Tests for the West Indies, and third player with the international career span over two decades after Tendulkar and Jayasuriya. Chanderpaul captained West Indies in 14 Tests and 16 One Day Internationals. A left-handed batsman, Chanderpaul is well known for his unorthodox batting stance, which has been described as crab-like. He has scored 20,000 runs in international cricket, and in 2008 he was named as one of the five Cricketers of the Year by the Wisden Cricketers' Almanack, and as the Player of the Year by the International Cricket Council. He made his international debut at the age of 19, but did not score a century in international cricket for three years, prompting some criticism. Early in his career, he was plagued by injuries, and was even dubbed a hypochondriac until he had a piece of floating bone removed from his foot in 2000. Since then he has enjoyed consistent form, scoring over 11,000 runs in Test cricket and is currently the 7th highest run scorer of all time in the format. Due to poor performances, Chanderpaul was dropped from West Indian squad in 2015. After that, he announced his retirement from international cricket in 2016, without a farewell, at the age of 41. 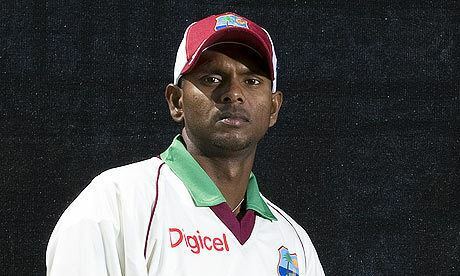 Shivnarine Chanderpaul was born in Unity Village, Guyana on 16 August 1974. His father, Kamraj Chanderpaul, helped to nurture his cricketing ability as a youngster. His ancestors moved from India to the West Indies as workers. By the age of eight, Chanderpaul was playing for his village's cricket team, and would frequently bat for hours, being bowled at by various members of his family. His father initially took him to the Everest club in Georgetown, but there was not a place for him at the club, and so he instead joined the Demerara Cricket Club. He appeared for the club's under-16 side while only ten. He was later given an opportunity at the Georgetown Cricket Club. During this time, he achieved the highest first-class score of his career, in a 1995–96 Red Stripe Cup match against Jamaica. In the first-innings of the match, which was eventually drawn, he scored 303 not out from 478 deliveries. In 2007, he subsequently joined Durham as an overseas player, and helped them to collect their first trophy by top-scoring in the final of the Friends Provident Trophy. In March 2008, Chanderpaul caused some controversy when, after batting for Guyana on the first day of a Carib Beer Series match, he left to attend the West Indies Players' Association awards and did not arrive to play the following day. He was 78 not out when he left the match, without notifying his team's manager or coach. He was recorded as retiring out on the scorecard, and later returned on the third day. At the ceremony, Chanderpaul was very successful, winning three awards as the international, Test and ODI cricketer of the year. During the English summer of 1993, Chanderpaul travelled with the West Indies Under-19 cricket team to England. He was the team's most successful batsman during the Test series, scoring 372 runs at a batting average of 124.00, including a score of 203 not out in the first Test, at Trent Bridge in Nottingham. In the 1993–94 Red Stripe Cup, Chanderpaul was near the top of the batting averages, and, according to the Wisden Cricketers' Almanack, he was a "contentious selection" for the subsequent Test series against England, in which he was picked as an all-rounder who could bowl leg breaks as well as bat. He bowled 16 overs in England's first innings without taking a wicket, and scored 62 runs in the West Indies reply. Chanderpaul played four Tests during his debut series, and was third amongst West Indian batsmen in terms of both runs scored and batting average, getting 288 runs at 57.60. Over the following couple of years, Chanderpaul was in and out of the West Indian Test side, missing a visit by Australia altogether. In his first 18 Test matches, Chanderpaul scored 1,232 runs at an average of 49.28, but despite scoring thirteen half-centuries, his highest score was 82; a Test century eluded him. He reached the milestone in his nineteenth Test, scoring 137 against India. Just over a month later, he repeated the feat in One Day International cricket, striking his maiden century in the format, scoring 109 runs, also against India. Chanderpaul scored a further century in each of 1998, in a Test match against England, and 1999, in an ODI against South Africa. In the latter match, Chanderpaul and Carl Hooper were the only West Indian batsmen to reach double figures while batting – Chanderpaul scored 150, and Hooper reached 108. Their partnership of 226 remains a record in ODIs for the West Indies, and Chanderpaul's individual total is his highest in ODIs. During this early period of his international career, Chanderpaul suffered with a negative reputation. Along with his failure to convert half-centuries into centuries, he had a tendency to miss matches which was perceived as hypochondria. He was also in the news for late-night partying; on one occasion in 1999, he shot a policeman in the mistaken belief that he was a thief. His career took a turn for the positive in 2000, when he had surgery on his foot to remove a floating bone. 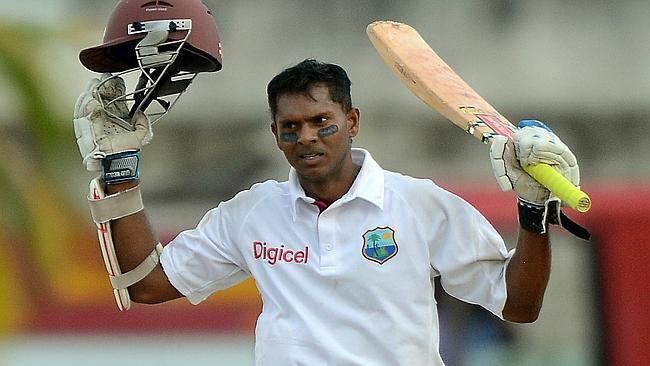 Free of his foot injury, Chanderpaul enjoyed the best series of his career to that point when he scored centuries in three of the five Test matches against India. In addition to his centuries, he also scored three half-centuries, and batted for a record 1,513 minutes between dismissals. The following year, against Australia, Chanderpaul scored a century from 69 balls – which at the time was the third fastest Test century. Later in that same series, the two sides scored exactly the same total in their respective first innings, and Australia then reached 417 in their second, leaving West Indies requiring 418 runs to win. No side had ever successfully chased that many runs to win in a Test previously; writing for Cricinfo, Andrew Miller reported at the end of the third day that "Victory [for the West Indies] is as unlikely as ever, but it remains a remote possibility." On the final two days, Ramnaresh Sarwan and Chanderpaul—batting with a broken finger—both reached centuries, and the West Indies completed the record run-chase with three wickets remaining. He subsequently suffered what ESPNcricinfo described as "an indifferent run"; despite scoring centuries against South Africa and Bangladesh, he averaged just over 35 across eighteen innings, of which six were against either Bangladesh or Zimbabwe. Facing England at Lord's, Chanderpaul narrowly missed out on a century in both innings in July 2004. He remained not out on each occasion, scoring 128 runs in the first innings, and 97 in the second, but the West Indies were beaten by over 200 runs in the contest. In late 2004, Digicel began a sponsorship deal with the West Indies cricket team, and caused division within the squad. 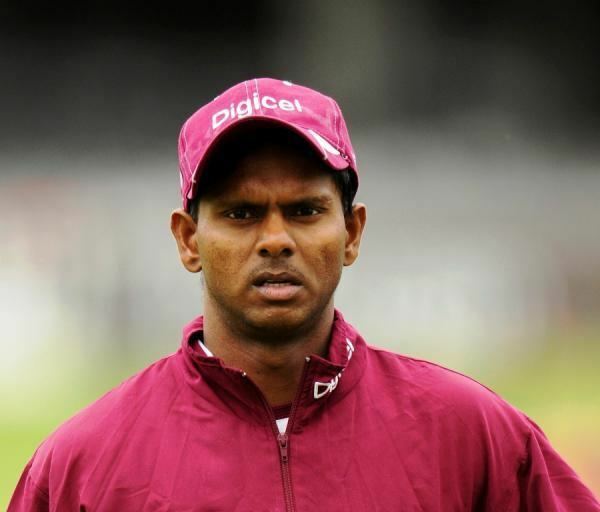 Initially, Chanderpaul was one of five players who did not attend a training camp due to disagreements about resulting commercial issues. For the following series against South Africa, seven of the West Indies best players were omitted from the squad due to contractual issues, but Chanderpaul had resolved his differences, and was named as captain in place of Lara, who was one of the missing players. In the first match of the series, Chanderpaul became only the second player, after Graham Dowling, to score a double century on his debut as captain in Test cricket. He remained 203 not out when he declared the West Indies innings closed; the joint-highest score of his Test career. Only a resolute batting performance from Jacques Kallis rescues a draw for South Africa in the match, although Chanderpaul was criticised for both the timing of his declaration, and later, negative field placings. For the second Test of the series, the West Indies were back to full-strength after the seven missing players cancelled their contracts with Cable & Wireless. Despite the return of Lara, Chanderpaul retained the captaincy. The second and third Tests of the series were both won by South Africa, before a high scoring draw in the fourth Test. Responding to South Africa's 588 for six declared, West Indies scored 747, in which Chanderpaul was one of four players to score a century. Less than a year after taking on the captaincy, Chanderpaul resigned the position, citing a desire to concentrate on his batting. Although his batting average during his captaincy was only slightly less than his career average, the West Indies only won one Test match and two ODIs out of thirty matches under his charge. The former West Indian bowler, Colin Croft suggested that Chanderpaul "was filling a space until some else could take over the mantle." Chanderpaul's stint as captain was generally criticised in the press; Nagraj Gollapudi, writing for ESPNcricinfo described his style as unconvincing, while Ian Chappell claimed that the West Indies needed a "father figure", rather than Chanderpaul, who he thought was "predictable and reactive". In early 2007, Chanderpaul recorded his second highest score in ODI cricket, hitting 149 not out in a losing cause against India. Later that year, he was the top-scorer for the West Indies during their series against England, aggregating 446 runs in three Tests at an average of almost 150. His achievements during the series earned him the man of the series accolade, and saw him named as one of the five Cricketers of the Year by the Wisden Cricketers' Almanack. He was especially praised by Wisden for his third instance of batting for 1,000 or more minutes without being dismissed, and for his century in the third Test on a difficult pitch. He scored another century in the fourth match of the series, and was named as the man of the match, despite an England victory. His performances throughout 2007 resulted in him being one of four players short-listed for the ICC Player of the Year award, which was eventually won by Ricky Ponting. In 2008 Chanderpaul continued in his form during the Sri Lankan and Australian tours of the Caribbean. During the 2008 season he rose to be ranked 5th in the Test batting rankings. By the end of the third test against Australia, Chanderpaul became the fourth West Indian batsman to accomplish 8,000 runs in Test cricket as well as rising in the ranks to 2nd of the ICC test rankings, just 4 points shy of becoming the world's number 1 ranked batsman. In the Test match series against the Australians, Chanderpaul had amassed 442 runs in 6 innings, in 3 of which he had remained not out, at an average of 147.33, including two centuries and three half-centuries. From the West Indies second innings in the first Test, he was not dismissed until the final day of the series – more than 1,000 minutes of batting without losing his wicket – the fourth time he has achieved this feat in Test cricket. In December 2013, Chanderpaul scored his 29th test century against New Zealand in the 3rd test match at Hamilton to equal Donald Bradman's haul. In the process, Chanderpaul also became the sixth highest test run-scorer, overtaking Allan Border's 11,174 runs. This was also his 17th unbeaten test ton, a new record – one more than Indian legend Sachin Tendulkar(16 unbeaten tons). In July 2014, he played for the MCC side in the Bicentenary Celebration match at Lord's. During the Third Test against New Zealand, he was out stumped by BJ Watling, the first time in his 20-year career that he had ever done so in any form of the game. In a test series against Bangladesh in 2014, Chanderpaul continued to show his durability by achieving scores of 85*, 84* and 101*. On 23 January 2016, Chanderpaul announced his retirement from international cricket. Aged 41 at the announcement, Chanderpaul did not played for West Indies since May 2015, due to poor performances in home series against England averaged 15.33 in 3 matches. He was also dropped from the WICM contract as well in December 2015. Chanderpaul is well known for his unorthodox batting stance, in which he stands facing the bowler, as opposed to most batsmen who stand side-on. He adopts this stance in order to see the ball clearly with both eyes, something he developed as a child when facing hostile fast bowling. Despite this, when he began playing Test cricket, he had a reasonably traditional stance, with his feet only angling slightly forwards. After a year of playing international cricket, he had eliminated the forward angle, and his feet pointed square of the feet in a classical stance. Between 2000 and 2005, he started to rotate his feet forwards, until they eventually pointed almost directly down the wicket, a position he has maintained since. While he faces forwards, his bat is angled towards square-leg, prompting Scyld Berry to describe his stance as "perfectly orthodox... provided the bowler delivers from next to the umpire at square-leg, not the one at the bowler’s end." Chanderpaul's stance has frequently been described as "crab-like", and his batting has been labelled as ugly. It has been suggested that these factors have resulted in him being underrated as a batsman. When the ball is delivered, Chanderpaul moves into a more traditional position to play the ball. As his stance has developed throughout his time playing international cricket, his batting aggression has undergone a similar transformation. He was first selected for the West Indies based on his attacking style of play; he cites Rohan Kanhai as one of his early influences. It was from Kanhai that Chanderpaul took his nickname, "Tiger". He maintained this style during the early part of his international career, but as the batting of the West Indies side around him grew weaker, he developed a more defensive style of play, and turned himself into what ESPNcricinfo's Vaneisa Baksh described as "the anchor of the team, the solid man." The Australian spin bowler Shane Warne described Chanderpaul as "a bloke you needed to crowbar away from the crease," and he is often labelled as "limpet-like." On 27 January 2017, he signed a Kolpak deal with Lancashire. Chanderpaul scored 30 Test centuries which included 2 double centuries. In ODI cricket, he scored 11 centuries. As of October 2016 holds the record of achieving the most times the feat of scoring fifty runs or more in both the innings of a test and remain unbeaten (or not out) (4 times). Most career runs in test cricket when batting at number 5 position with 6,883 runs.